Rita Mae Brown, author, her mystery series co-authored with her cat, Sneaky Pie Brown, featuring Mrs Murphy, a feline heroine. The first in the series written in 1990, is Wish you Were Here. Many of her books are set in the great state of Virginia. They are lighthearted and a breezy read. 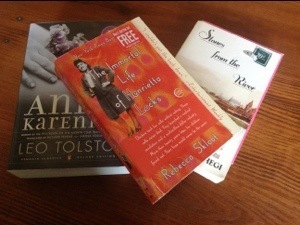 This entry was posted in Life and tagged book list, read, Summer. Bookmark the permalink. ← Do I have to eat it? Jamie, I have to urge you to read Ann Voskamp’s 1000 Gifts. I am so taken with her ideas and her style. I think you would love her. Donna, I read it a few years back and Ido love her style and the way she lives life in each moment! Jamie, thanks for the list! I love to read. I’ve been reading books by Lois Tverberg called “Sitting at the Feet of Rabbi Jesus” and “Walking in the Dust of Rabbi Jesus”. They helped me understand the words of Jesus in their 1st century Jewish context are were just fascinating. Mary, thanks for the book tips. I will have to add them to my summer reading list.